Google today launched the UK Carbon Footprint Project to help you lead a greener life by calculating, tracking and comparing your carbon emissions with people in the rest of the UK. If you're keen to reduce your carbon footprint but you're not sure how, or if you want to see how your individual actions can make a difference to climate change, then check out the UK Carbon Footprint Project website. The Google Carbon Calculator helps you calculate your personal carbon footprint, choose carbon-reducing steps from a personalised action plan and compare your actions to those of others around the UK by putting yourself on the Google UK Carbon Footprint Map. You can add the Carbon Footprint tab (or section) to your personalised iGoogle homepage to make it easier to keep track of your progress. You can tick off your carbon-reducing actions as you take them to automatically update your carbon footprint on the UK Carbon Footprint Map. There are also plenty of widgets with tips and updates available. 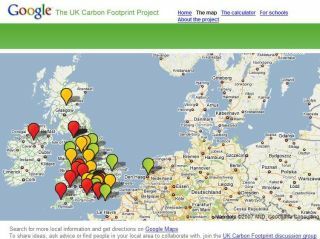 The Google UK Carbon Footprint Map also shows key facts about the UK's carbon emissions and climate change. Information layers on the map show details such as predicted future weather under different carbon emission scenarios, the recycling rates of local councils, heat map images of famous buildings and where your nearest renewable energy sources are. "We want to help people find the information they are looking for as quickly as possible and that's why we have launched this project," said Ed Parsons, geospatial technologist at Google. "Whether people around the UK choose to start with small steps or giant leaps it will now be easier for all of us in the UK to see how through collective efforts we can make a real difference in reducing our carbon footprint," he added. Google worked with a number of organisations, companies and the government to create the layers for the UK Carbon Footprint Map and the personalised iGoogle homepage. "I am delighted that Google is using our data and calculations for its carbon calculator which forms part of its new web project. The project is interactive and, I trust, will encourage people to find ways to reduce their personal carbon footprint," said Hilary Benn, environment secretary.